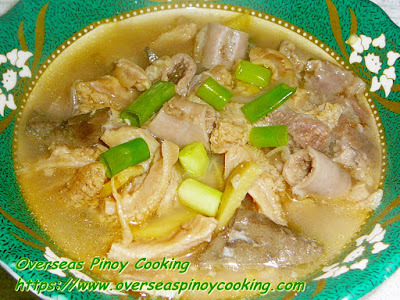 Papaitan or Pinapaitan, for those who don’t know is a sampalok and bile flavored stew of tripe and innards. It is either an ox or goat. (baka or kambing). This dish is popular with those who love drinking liquor. It is one of the mainstay dish of restaurants along the h-ways if you have ever traveled up north or Ilocos country. I know a lot of people want to know how to cook this dish. Cooking is fairly simple except that it require a lot of time to get the innards to get cook to tender especially the tripe, not unless you want to use the pressure cooker but you won’t get the same tastiness with slow cooking. When buying just ask the butcher it is for papaitan and most likely he knows what it is, so he will be giving you a set complete with diluted bile. Here in Abu Dhabi it is the meat shop way of attracting Filipino customers, by selling meat cuts the way Filipinos want. Here are some tips in cooking papaitan. Wash thoroughly. Parboil the innards with garlic and ginger for 15 minutes, discard water and rinse before slicing. Add bile small amount at a time so with sampalok. Until you get the correct sourness and bitterness. Wash thoroughly ox innards, drain and cut into small slices, set aside liver. In a sauce pan put all innards, whole garlic and crushed ginger cover with water and boil for 15 minutes, drain and discard liquid. Rinse and add fresh water and boil for 1 to 2 hours or until innards are tender. Remove from pan separate broth and keep aside. In same sauce pan sauté onion, garlic and ginger. Add innards including liver stir for 3 to 5 minutes, add patis and cook for another 3 to 5 minutes. Pour in broth and simmer for 10 to 15 minutes, add siling labuyo, sinigang mix and goat bile (half quantity at time and taste sourness and bitterness add more if required). Simmer for another 3 to 5 minutes. Season with salt and pepper, garnish with spring onion. Serve hot. as an ilocano dish, i learned how to cook papaitan from an ilocano. i was told that the main ingredient in papaitan which should also be the main source of that bitter taste is the "papait" or the bitter juices/extracts inside the small intestine. the bile is just used to add bitterness to those who want it extra bitter. I like my papaitan soured with sampalok or kamias, tamarind sinigang mix is good subtitute if the fresh fruit is not available. pinapaitan is an ilocano recipe and ilocanos use the juice from the small intestine we call "pait" or the juice from the large intestine, we call "pinespes". most ilocanos prefer pure pait but some add "pias" or "salamague" to give some twist. use the "siling pangsigang" instead of "labuyo:" especially when it is not intended for "pulutan"
Yes, pinapaitan is an ilocano recipe. Way back then they use the juice extract from the small intestine and separately boil the contents of the large intestine and squeeze and extract juice from it and mix it with the bile or pait. Nowadays, you can buy bile extract and frozen small intestines that you can slice it while it is still half frozen to save the juice. It is no longer recommended to use the juice extract from the large intestines on health issues. You can add camias or tamarind for the sour taste or you can use the Mama Sita's tamarind flavor as substitute and the siling pangsigang. It is best when served hot with thinly sliced green onions on top. Thanks guys for your info, this is great and I am sure your feedbacks are also being appreciated by other readers. Nag try po akong mag luto ng papaitan recipe mo...It was my first time but it's perfect. Also your Royal Bingka recipe.Kaya lng nag ka problema ako dun sa oven ko kay medyo nasunog sa ilalim but the taste is good pa rin. Di masyadong matamis at masarap talaga.I'm happy at nagustuhan din po ng mga frends ko. And i'm proud kahit first time kong niluto yun, OK naman po. I have one request, if you could please send me your maja blanca recipe to my email add: rachel_besmanos@yahoo.com...I will appreciate it very very much...Thanks in advance. intead of using sinigang mix put calamansi. As mentioned on the above write up the recipe uses papaitan set which is usually available in most Metro Manila or provincial wet markets. The set should have a cut of everything including a cup or so of diluted bile. there are so many way how papaitan is cook. it depends on where region it is cook or who the cook is...the main "pait" is either pure bile (add few drops) or as we call it in our province "pinispisan" or the diluted bile. in nueva ecija some uses the tamarind young leaves some people use the leaves of caalibangbangan. in the end "pinapaitan or papaitan" is bile + the sour base soup. will it taste like the pinapaitan using the bile? I have not tried using ampalaya leaves, however I tried once using the fruit, it's not comparable but the trick works. i am ilocano and i grew up with this recipe always in on the lunch table when we come to visit la launion. i missed it so much since i came here in jeddah (3 years already). im glad u share this recipe. my father and my lolo used to cook it for us. That is too long to be away from home, i wish you'l be back home soon.